Siri can give turn-by-turn directions in iOS 6, and that's because Google refused to. Apple’s new Maps application in iOS 6 has come under quite a lot of fire since its public release last week. Directions are wrong. Locations are incorrect. Apple has begged its customers to give the new Maps app time, but complaints still run rampant. The mapping data has definitely changed, and that’s because Apple abandoned Google Maps. Besides the obvious Android vs. iPhone rivalry, why exactly did Apple and Google part ways in iOS 6? 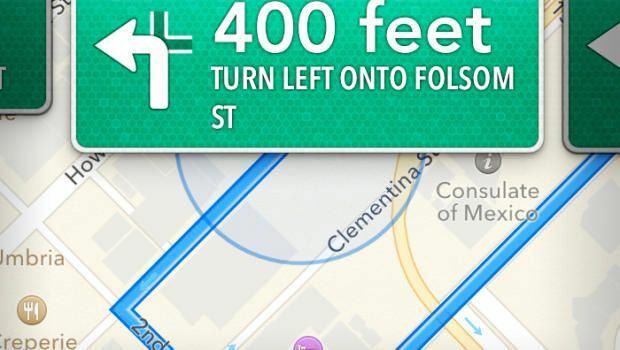 According to a new report today, Apple wanted Google’s turn-by-turn navigation service in Maps. Spoken turn-by-turn navigation has been a free service offered through Google’s Android mobile OS for a few years now. But it was never part of the deal that brought Google’s maps to iOS. And sources say Apple very much wanted it to be. Requiring iPhone users to look directly at handsets for directions and manually move through each step — while Android users enjoyed native voice-guided instructions — put Apple at a clear disadvantage in the mobile space. And having chosen Google as its original mapping partner, the iPhone maker was now in a position where an archrival was calling the shots on functionality important to the iOS maps feature set. And this caused Apple — which typically enjoys very tight control over its products — no end of philosophical discomfort, sources say. It pushed Google hard to provide the data it needed to bring voice-guided navigation to iOS. But according to people familiar with Google’s thinking, the search giant, which had invested massive sums in creating that data, and views it as key feature of Android, wasn’t willing to simply hand it over to a competing platform. Google wanted more control over Apple’s Maps app, and Apple wouldn’t let Google have its way. Then the tables switched and Apple wanted Google’s marquee Maps feature from Android. Google said no, so Apple decided to make its own service. Apple wanted to kick Google out so quickly that it gave Google Maps the boot before its contract with Google had even expired. If you’re already sick of Apple’s Maps, the good news is that Google is working furiously on its own Maps app for the iOS App Store. The New York Times reported earlier today that Google plans to have its new Maps app submitted to Apple by the end of the year.